ON THREE – GO BEARS!!!! 25 Years and still going strong! 25 years ago this week, easily one of the most momentous occasions in my life happened… I’d like to say I was 14, but I know no one will believe it. 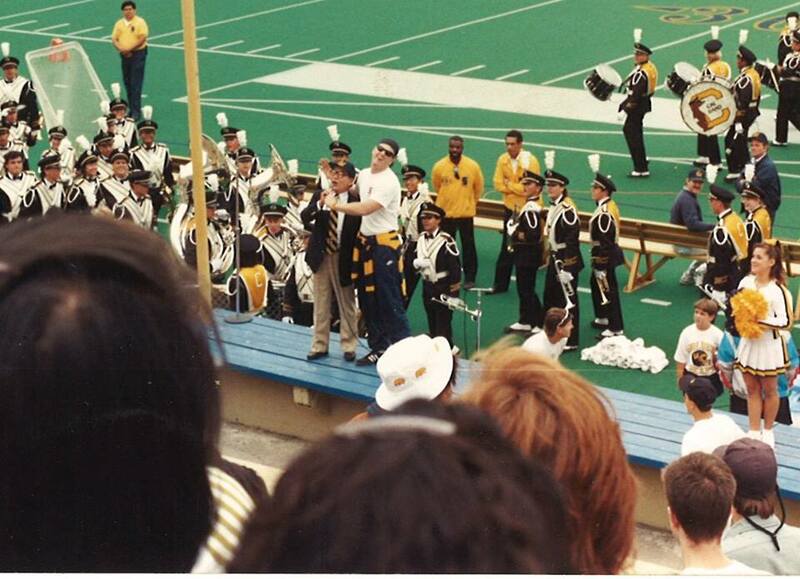 On September 15, 1990, during a Cal Football game against the defending national champion Miami Hurricanes, I stepped out of the student section in Memorial Stadium to commandeer the mic and begin my stint as micman. Nothing in my life has meant more to me than my relationship with Cal and that moment cemented for me for all time just how impactful it would be. It has been a phenomenal ride that to this day allows me to meet so many great people from every walk of life, every age, from students to alumni to notables and fans alike. But if you’ll allow me I’d like to set this up just a bit. A couple of Sundays ago I had the incredible privilege and thrill to address the Cal Football team after practice as they prepared to head into a new season. I wrote about it here and I think it’s safe to say you’ll be hearing this story over and over as I get older! I’m a big believer in seizing a moment when life presents it. I believe this year has the potential to be a special year for the Cal Football team. Now these moments don’t come along often… They’re what I call “Brass Ring Moments.” I relayed to the team that the opportunity this year is theirs. They just have to recognize it. They have to believe they can take it. And then, and this is the important part, they have to actually go and GRAB THE BRASS RING!!! Well 1990 was one of those moments for me. And because, I’m sure without really thinking, I grabbed the brass ring, my life has been changed in ways I would have never imagined. When I was a kid growing up, my friends and I would hop on BART and venture into Berkeley to go to Cal games… We would eat at Blondies, pass all the houses… I dreamed of one day sitting in that student section as a Cal student… If we had a day off from school, my best friend J.R. DeLaney and I would go with his sister who was a student and tag along (I’m sure she loved that) and would actually sit in classrooms and just be in awed reverence of where we were. So when I finally made it into Cal we were in the middle of a pretty rough stretch. But as I said, 1990 was going to be different. Now a little back story is that I had sort of been an informal mic-man at hoops games for a while. There was a guy that used to do it – Dave, and I cannot remember his last name, so if anyone know him let me know. He was a good guy and I think a good mic-man. If he wasn’t at a game, I would lead some cheers and I liked it. My friends and I always sat in the same place at Harmon; first row directly opposite opposing team bench (that way we could taunt them more). So people definitely knew who I was. At the time, I was also the doorman at Raleigh’s so people knew me from there too. Matter-of-fact, when we had a line at Raleigh’s I would let people in based on whether they could answer CAL trivia or sing lyrics to the fight songs. All this is my way of saying that when I eventually took the mic people were familiar with me and knew my passion. So it was September 15, 1990. Miami was coming off of their National Championship. The week before, CAL had beat Wisconsin, in Madison. This was also Russell White’s first game in Memorial… There was a sense something big could be happening… even so, back then Cal wasn’t much of a draw and only 47,000 people there that day. So we’re playing Miami tight in an entertaining game. But the students just weren’t really “into” it. At that time there was a “team” of micmen, and they were terrible. Now I don’t want that to sound too harsh because their hearts were in the right place, but they just didn’t quite have that intangible you need to be a great micman. So I think it was the third quarter and while CAL had the ball, one of the mic folks started chanting a defense chant… I have no idea what he was thinking (hey sometimes we all blank on situations) but I distinctly remember dropping my head into my hands in resigned frustration. So two of my friends with me at the game, Erin and DeAnn, totally started saying “you should go down and do it…” Well, to be honest, it didn’t take much encouragement 😉 So I walked down the steps, went up to the podium and literally said “Would you mind giving me the mic…” and I just took the microphone. And there I was in front of 7,000 of my fellow students with no plan or intentions that day of doing this. I can’t explain what a high it was and how exhilarating to have everyone do what I just told them to do. 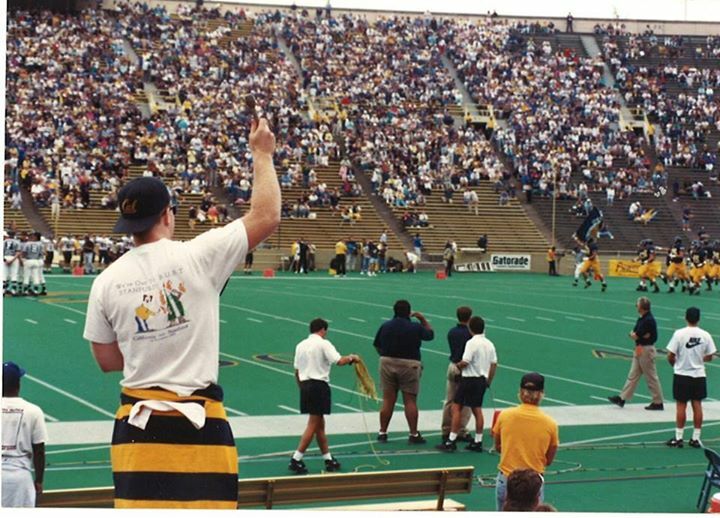 Then I said “You can’t cheer sitting down, you all need to stand up!” That’s right, back in the day people actually sat down during the games… So then everyone got up… again, I was thinking to myself “wow, they’re doing what I’m saying.” So we did another Go Bears! and that is how it all started… Now, sometimes in life you need providence… So a little later Miami was about to punt and I got everyone chanting “Block that kick! Block that kick!” and you know what, we blocked the punt!!! Now we had absolutely nothing to do with it… So I of course immediately turned to the students and said “THAT WAS ALL YOU!! !” a they went wild, and while I am sure it was unrelated, it got everyone thinking they could have an impact on the game. It was awesome. Even though we lost the game literally hundreds of people came up to me after, in the stadium, at parties at Raleigh’s and told me I should keep doing it. That Monday, when I got back from classes I had three messages on my answering machine. One was from then AD Dave Maggard. I would later find out that Jack Clark was standing with him on the sidelines during the game and told him “You need to get that guy (me) doing that permanently!” The second message was from Coach Snyder thanking me. Now think how cool that is for the football coach to call a student he didn’t know to thank him for something like that. The third message was from Diane Milano asking me to come meet with her to do it full time. And that’s basically how it started. It was an amazing three year run that ended with the Big Game in 1992 and the student section ceremoniously rolling me up! You could not have had a better exit for a micman! I made sure to hand off my wallet to a friend before getting rolled up! Made it all the way to the top! 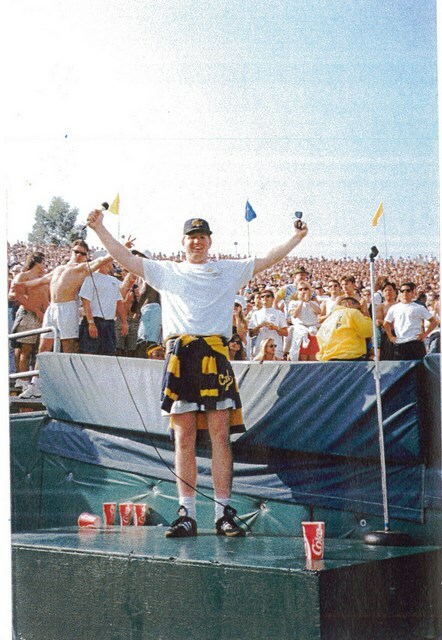 And 25 years later Cal is as big a part of my life as it was then… I’m so incredibly fortunate that I get to stay so involved… I’m telling you, they’re going to be wheeling me out at the bonfire rallies when I can no longer walk! We live in an amazing time, because of technology and social media, where traditional boundaries don’t exist… as a result I have so many friends that span generations… From people well into retirement, to my own age, in their 30s and for me the most fun, students at Cal. It amazes me how people see the world… and it works… It also always amazes me people stay friends with me, but man am I glad they do!! As I often say to the students who are my friends “I may be more than twice your age, but I have half your maturity so it all works out.” Never, ever get old… Don’t do it. When I go to a basketball game I would much rather sit in The Bench than in the good seats so you’ll frequently see this, where I’m clearing bringing up the average age of the section! Somehow, for some reason they keep letting me in. It’s been a crazy Walter Mitty experience for me that let me do things, like talk to the football team, or lead the Cal band, that continues to astound me. If you made it this far thanks for being a part of this with me. All of you have made the last 25 years absolutely amazing for me… I mean that… not to get all Lou Gehrig, but I really do consider myself the luckiest person to ever have attended this amazing university. And between you and me, I’m hoping the next 25 are just as amazing… I’d be remiss to leave you without one, last cheer… So… GIVE ME A C!!!! Ken, my friends and I were freshmen at that key game vs Miami. We were fired up, and you taking the mic was a key part of that fuel to our fire. I was fortunate to follow directly in your footsteps along with Eddie to try to carry the torch (and for me to start actually carrying a gigantic flag ). As happy as I was to do my part, pull for our teams and travel the country doing something so fun and unique, I tip my hat to you for being the first, the best and the consistent model for what any mic man should aspire to. Go Bears! Dude, I’m getting old, you’re going to make me cry! 😉 I think you and Ed carried the torch awesomely! Those were glorious days my friend, simply glorious.